We want our children to grow to be happy and successful, yes — but more specifically, to be responsible, respectful, grateful, honest, kind, empathic, helpful and giving to others. The irony is that traditional methods of parenting — varying degrees of reward and punishment, threats and criticizing — teaches exactly the opposite. In my 30 years of working with parents on how to better connect with their children (ultimately resulting in better behavior), I have learned one thing over and over and over. It’s all about relationship. In order to get respect from our children, we need to be respectful of them. Nothing else needs to be taught about how to be a good person that consistent work on a gratifying and mutually respectful relationship doesn’t teach. But it’s not simple. Understanding the power of connection. Empathizing with and understanding your child’s agenda, instead of telling them what to do and expecting it to be done according to your agenda. This may be the hardest — stepping back and trusting your child to do the right thing and allowing many mistakes to get there. Trusting means letting go of nagging and hyper-vigilance. No blaming and criticizing. The message you intend isn’t the message that is received. A child who feels bad about himself, behaves badly. The ability to remain objective and observe what is happening right now rather than getting triggered by the past or fears of the future. Understanding and allowing all of your children’s desires and wishes — not fulfilling all of them, just acknowledging them. Finding balance through understanding that no family member’s rights and needs are any more or less important than another’s. Holding appropriate expectations for each child to insure they feel accepted. Accept the child you have, not the child you wish you had. If your expectations are too high for this moment, your child will think he can never be who you want. 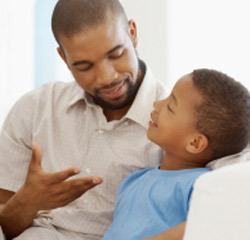 Maintaining respectful interaction with your children even when setting a limit or correcting behavior. There is never a need to be disrespectful. Firmness and clarity is all part of establishing mutual respect. Maintaining a respectful relationship with your spouse or partner to model the relationships you hope your children to have. Being the type of person you want your child to become. A good relationship is like a mobile dancing in the breeze. It requires sacrifice, compromise, give and take, and respect for one another — balance. A good relationship is mutually satisfying and leaves you feeling better and stronger. Balance in the relationship comes through understanding and consideration of each other’s needs and agendas — very different for adults and children. But this nuanced understanding comes with maturity. A young child wants what she wants when she wants it and cannot be expected to halt that want to consider another’s wants. Maturity is the process of gradually understanding that others also want what they want. With maturity comes compromise — necessary for relationships to work. In the parent-child relationship the obvious difference is the disparity of age. The parent cannot expect a maturity level beyond the child’s stage of development. That’s why parent’s are necessary in a child’s life — to use authority when a child cannot be expected to. So when a toddler runs away when called, it is to play a game, to be chased, not to be defiant. The toddler cannot be expected to consider the parent’s desire to get out the door. So when a child doesn’t want to go to bed, it is because he wants to play or be with his parents, not because he is stubborn and refuses to listen. He cannot be expected to know how much sleep he needs. So when a child is told she cannot do what she wants, she will react to feeling thwarted, fearing she will never get what she wants. Her reaction is not to “get you” or gain control, or manipulate you. It’s simply to get what she wants. So when a teen wants to be left alone and make his own decisions about his life, it is because he longs for independence and to be treated like a grownup, not a child. It is not because he is being belligerent and oppositional. It is the parent’s job to understand where the child is coming from. It does not mean ignoring the runaway child, letting him stay up late, giving her whatever she wants, or allowing him to make all the decisions about his life. It is about understanding the child’s point of view that is likely very different from yours. If you think, She’s got to learn, He can’t get away with that, She’s doing that just to get attention, He refuses to listen, then you will likely use some form of coercion to control the behavior to get the results you want. We know this does not work. Go for a healthy relationship instead. 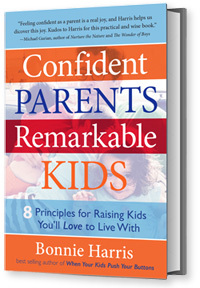 Confident Parents, Remarkable Kids: 8 Principles for Raising Kids You’ll Love to Live With can help you shift your perspective of your child and his behavior so that your anger can shift to compassion and understanding — frustration probably; annoyance undoubtedly, but much less anger. I love this & especially the way Bonnie has so clearly & concisely written the 10 points. I have never been able to lecture or instruct my child on being a ‘good person’ because he’s just not a child who will listen to lectures. However just lately (now 10, going on 11) he has started to show signs of being just such a person – very polite, very considerate of my needs. I believe that just as Bonnie says, it has come out of me being considerate of his & other people’s needs, being honest, etc and as Bonnie says, it has come naturally with age/development – there was no need to force it.